You probably already know that SEO is short for "Search Engine Optimization". It's a buzzword dropped constantly in marketing articles but few mention just how difficult it can be to master. When we conduct a search with a string of keywords, such as "Best restaurants nearby", the search engine uses an algorithm to rank the results by relevancy. Google's goal is to make it as easy as possible for searchers to find the answers to what they're searching for.. As technology develops and our search habits change so too does the algorithm. When you produce content it should be helpful and relevant to your audience. This also includes the experience your reader gets on the page, from the moment they arrive on your website, through to the links you've provided in your content. Adding a title, description, images and other pieces all help to "optimize" your content for a search engine. Google's algorithm will crawl your website periodically, checking to see if you have met their expectations. It will then rank you against similar articles (based on keywords) and your site will appear in the results when someone does a search for this topic. If you haven't already guessed, content and SEO are inseparable. You can't start ranking your website on Google without creating content - your website! Conduct competitive research, interview your ideal readers (read more about buyer personas here), and write a list of keywords that describe the topics your website will cover. For example, maybe it's a site dedicated to "sewing for beginners". 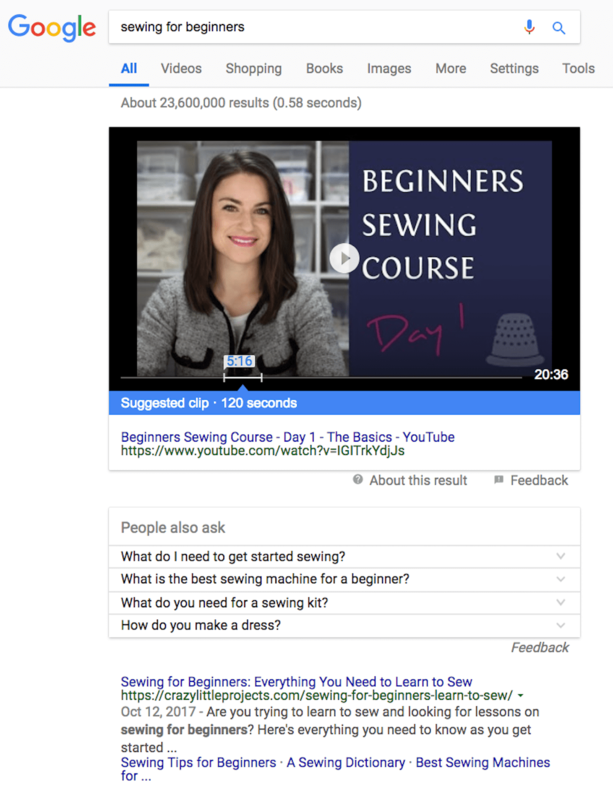 A cool new feature on Google is that common questions related to your keyword search will appear in a box, giving you some future content ideas. If you scroll to the bottom of the results page you'll see a group of keywords.These keywords are the most popular keywords related to your search. Now that you know what you focus will be, it's time to tell Google! Brainstorming keywords is difficult at first but over time it will get easier. Google Keyword Planner is invaluable because it shows you how often people search for keywords and how competitive they are to rank. It's really hard to rank for short keywords like "social media" because it's vague and you're competing with sites like Forbes, The New York Times, Buzzfeed etc. Instead, focus on ranking highly with long-tail keywords. Usually made up of more than three words, long-tail keywords, are more specific searches. These keywords are less competitive and are easier to rank for, but won't drive as much traffic as the shorter keywords. So, instead of trying to rank for "social media" you could try "social media marketing tools for beginners". The Google Keyword Planner is meant to be used by advertisers, so the "competition" level shown refers to how popular a keyword is with paid Adwords. But it still gives us a good idea for how difficult it is to rank for a keyword based on what advertisers are selecting to promote with paid spend. Newer bloggers/websites should target 'LOW' competition keywords that ideally still have a decent number of average monthly searches. If it's too low then it's likely not worth your time to invest in creating content based on that keyword.Keyword planner is free to use but you'll need to sign up for a Google Adwords account. They make you put a credit card in, but when you create a campaign, immediately pause it and you will have free access to the Google Keyword Planning tool! To start putting these keywords to use, you need to publish content on your website, both on pages and on your blog. Most of what you would have heard about SEO comes into play here with on-page SEO rules. Use this detailed checklist from Moz to reference while you learn the ropes. These days our searching capabilities have expanded to include social networks, websites, and even voice activated technology such as the Amazon Echo, Google Home and Apple's HomePod. How SEO develops to include these new mediums remains to be seen. Google incorporating "rich content" like videos and recipes into its search results is one example of how SEO is moving with the times. Learn how SEO impacts the success of influencer marketing!